An original copy of any complete game in the Ticket to Ride series is required to play with Warehouses & Depots. 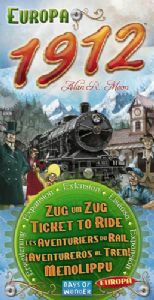 New Destination Tickets are for use only with Ticket to Ride Europe. Upgrade your ticket with exciting new routes to the great rail destinations of Europe and add fresh new gameplay to all versions of Ticket to Ride with Warehouses and Depots! A two or three player only Ticket to Ride game. This time the journey is through Scandanavia.